That question keeps coming back - should you blog? That question keeps coming back – should you blog? Business owners keep asking whether or not they should have a blog. They’ve heard of blogging, but they are not convinced it has any business benefits. Rightly, business owners need to know if their is a return on their investment in blogging; and it’s not just the costs of the technology – there’s time involved as well. New data suggests a mixed picture. In one study around one in three women said they were influenced by a blog – it actually helped them make a buying decision. Interestingly around a third also said that blogs helped them decide not to purchase an item. The study also showed that half of people said blogs did not influence them one way or another. This is fascinating since the percentage of people who said they were influenced is greater than 50%, suggesting that people do not always answer surveys honestly. Or it could indicate that people are influenced by blogs but do not wish to admit it. 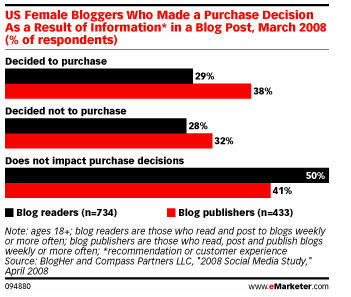 Either way, clearly people are influenced by blogs as part of their purchasing research. Hence, if your business is not blogging, you are missing out on a potential way of creating interest and promoting your sales amongst your readership. Another report shows us that two-thirds of people online read a blog post at least once during each month. And of these readers, the report shows us that 43% of them notice the adverts. This is a much higher proportion than for many other forms of advertising – such as print adverts. It seems that the engagement with blogs makes people more aware, rather than less aware. However, the advertising needs to be highly specifically targeted to the topic of the blog. Blogging, therefore, is proving successful. Your readers can be helped to make purchasing decisions. And if you are selling keyword related advertising, it is more likely to make you some money by appearing on a blog, than on a similar web page. But more important than any of this – blogging makes your web site seem “current”. People dislike old, static web sites. They expect your web site to be constantly updated and different on each visit. Blogging allows you to do that and hence provides you with a quick and cost effective way of engaging your audience because they feel your site is fresh on each visit. And we haven’t even begun to consider the search engine benefits of blogging. There is no question. So if you are asking “should I blog?” change it to “When will I start blogging?”. It’s not if, it’s when. Focused social networking – the way to go…!